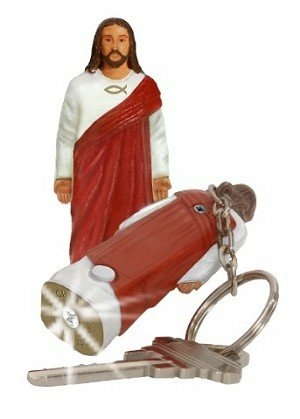 This is a 2 inch Jesus Flashlight Keychain Icon collectible. Each flashlight keychain has an Ichthys Fish graphic on the chest and a Sacred Heart graphic on the chest. This inspirational Jesus Flashlight Keychain Icon Light has a pure white LED light, fits comfortably in your pocket, can freestand, and has a 1" key ring on a link chain.